The concrete block is piled up, the base of the warehouse is made, and the millrace is repaired by using cement (mortar) when engaging in farming in the part of mountainside. It often makes it mixing concrete at that time. I think that my making is more when the scale is small though such concrete might be bought from the raw concrete company. Think about how to make concrete this time. Gravel (Balas) is turned on after cement (Porto land cement) and sand are put in the kneading ship (kneading box) and it often mixes it with the hoe and the shovel, etc. and it mixes it further in case of little. Afterwards, it often stirs it adding water little by little. It doesn't mix heavily and well when all cements, sand, and gravel are put first. When a large amount of concretes are made, concrete can be easily mixed when there is such a cement mixer of electric or the engine type. I am not using it so much though I have an electric cement mixer. It is because it is serious that it will clean in the mixer later. When a small amount of concrete is frequently made, the hand work is still convenient. Standard concrete makes cement 1, sand 3, and gravel 6 from the capacitor ratio mixing it. To raise strength a little, cement 1, sand 2, and gravel 4 are made from the capacitor ratio mixing it. To make not concrete but mortar, gravel (Balas) is not mixed. The ratio of the mixtures is almost the same as concrete. Concrete durability increases to the water cement ratio (% compared with weight) by increasing of the ratio of cement by decreasing of the ratio of water at the rate of water to cement. A usual water cement ratio is 50-60%. In a word, cement about 2 is mixed with water 1 compared with weight. Because the weight for each unit volume of cement is about 1.5g/cm3, it becomes cement 1 for water about 0.75 in the volume ratio. Because kneading concrete in a word hard can increase concrete durability, water is not increased more than the necessity. However, when water is too little, striking the small place concrete becomes difficult. It is noted that sugar doesn't mix with concrete. If the ice cream drops in concrete even a little, concrete stiffening time becomes very long if it does while eating the ice cream for instance when mixing concrete. It is important not to bring the one with sugar when concrete is mixed close. When concrete is thrown, they are made to settle down because it suppresses it on with the rectangular lumber, the horizontal bar, and trowel, etc.Moreover, the space made concrete is lost. Afterwards, concrete surface is averaged to smooth by trowel. This goes well when do not do at a time but dividing into several-time. It takes care spending time when pouring concrete. It is made not to dry in a word too much fast. The care seat is multiplied by a concrete surface, it defends from direct sunshine, and moisture is prevented from evaporating. Concrete cracks, and strength falls if it dries it fast. There is not this though concrete has the person who thinks that water evaporates and it becomes hard. Water is necessary so that concrete may stiffen. There is often not drying while concrete hardens. I think that you should sometimes sprinkle water on a concrete surface when the surface seems to dry. Concrete is very weak to the power of the pull for the power of compression though it is very strong. Concrete strength can be improved to concrete further by burying strong iron (reinforced concrete) under the pull on the inside. This is called ferroconcrete. The reinforced concrete can prevent iron from rusting by covering the reinforced concrete with alkaline concrete because it is weak to rust. 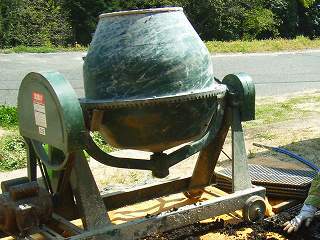 It is important that the amount of the cement mixed when mixing concrete be not reduced therefore. Moreover, an enough thickness (3-4 lowest thickness cm) is necessary for concrete around the reinforced concrete. The salinity of sand in concrete might become the rust problem of the reinforced concrete as attention of others. It is also important to use not the sea sand but the river sand. When work ends, tools used are often washed in water. Because cement doesn't drop in having thrown by water, it washes in using trowel, the shovel, and the reinforced concrete, etc. while often dropping mortar. The washed water is not thrown into drainage and distributed in the vacant lot etc. without the problem. Because cement stiffens in water, there is a possibility that drainage is blocked, and an alkaline liquid affects the environment negatively.